The GDP was founded in August 2015. A year later, its chief architect, Kem Ley, was assassinated in broad daylight in Phnom Penh on a Sunday morning. 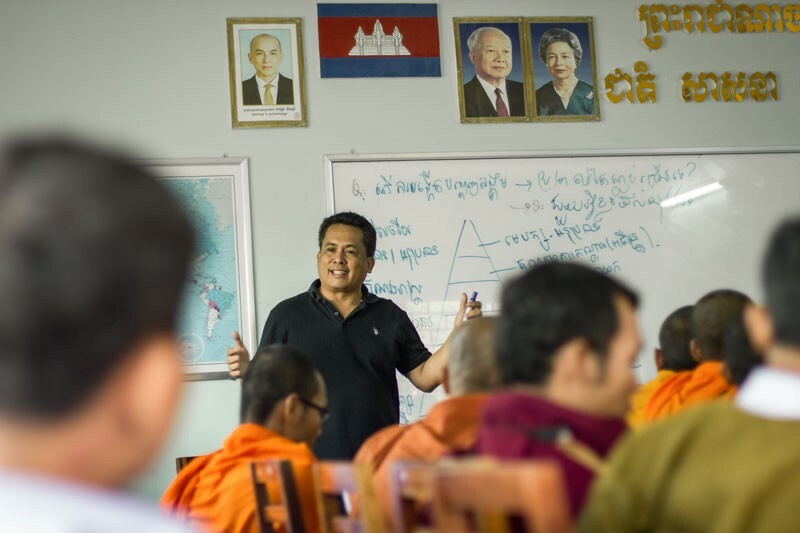 The popular social commentator was on July 10, 2016, shot in the temple and beneath his arm from point-blank range moments after sitting down for a gas-station coffee in a Caltex in central Phnom Penh — a twice-daily ritual. After her husband’s death, a pregnant Bou Rachana fled with her four young sons to Bangkok, where she gave birth to a fifth son. She was then last year granted a visa to move to Melbourne, Australia, where she now lives and has slowly started to speak out on social media. Crushingly for Saing Koma and Inn, Rachana has sided with the CNRP. 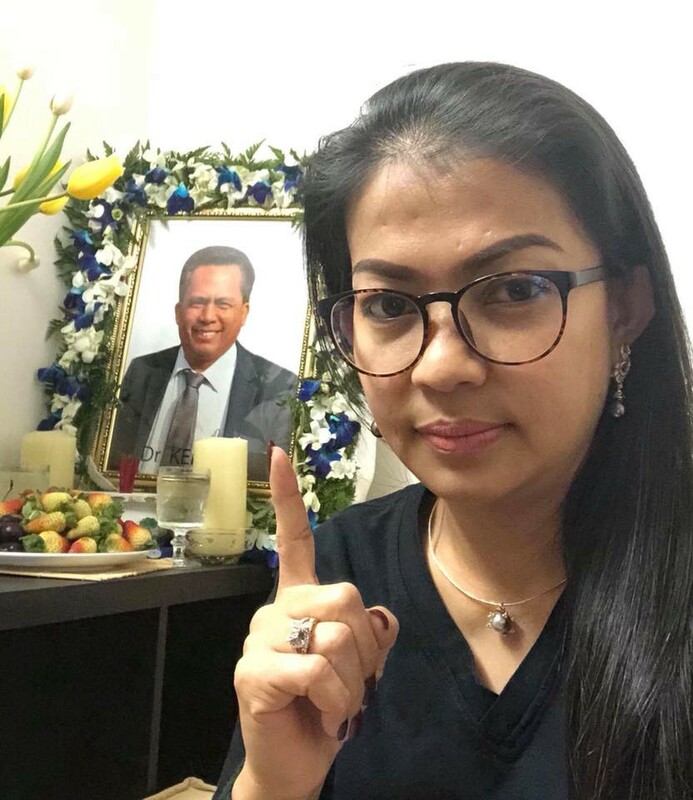 Two days after the GDP selected Saing Koma as it candidate for prime minister in the July 29 election, Rachana took to Facebook to post a selfie showing a raised forefinger — symbolically unblemished by the ink used to stain fingers to prevent people voting twice — to declare her stance. The image of the raised finger, which has become an increasingly popular gesture for pro-boycott voices in the face of government threats (named the “Clean Finger” campaign), was widely shared by Cambodians. Then in an interview with Radio Free Asia a week later, she said she believed her husband too would have boycotted the vote. “I will absolutely not participate in this mess of an election and what’s more, if my husband still had his life, he too would not be satisfied and he too would not go and join in the election,” Rachana said, calling the ballot a meaningless exercise. “We are citizens, we have Cambodian blood, and we are the masters of our nation and owners of our ballots,” she said in the interview. “We have the right to decide [who to vote for] according to the desire of our hearts,” she said. It was a victory for the CNRP, not least because Rachana and her sons attracted intense pity from Cambodians across the political aisle. But it was also a symbolic victory because Kem Ley’s shadow still looms over Cambodia as a memory of a time when things finally seemed to be improving. For a while, the plain-speaking analyst, who spoke in allegories and rose to prominence in frequent Radio Free Asia interviews after the disputed July 2013 election and amid the months of protests afterwards, had appeared to be deftly carrying out a political balancing act long thought impossible by many. 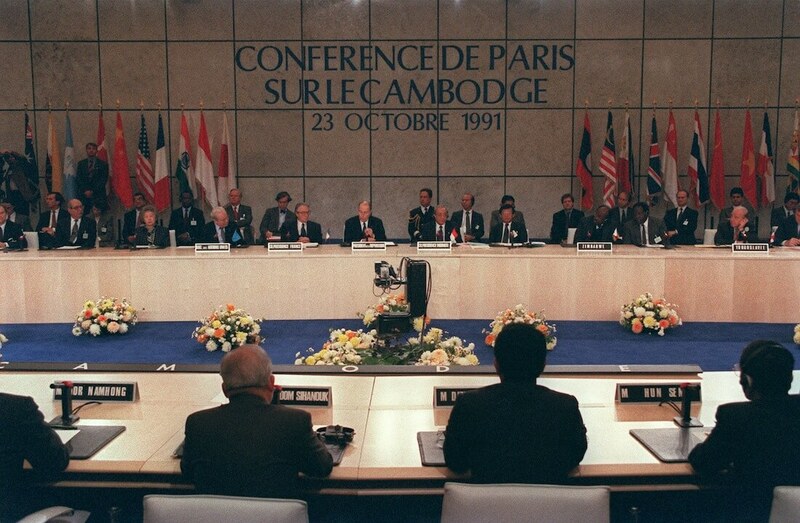 Unusually for a Cambodian in the political spotlight, he had strived to keep up an reputation of independence between the government and opposition, believing that Cambodia would forever be kept under the thumb of foreign powers if no one stood up to unite its leaders in common cause. 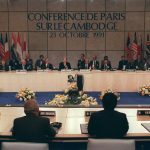 For many who had tired of watching Hun Sen and Sam Rainsy bickering for the past two decades, he was a breath of fresh air. Only a lowly adviser in the Health Ministry shortly before the 2013 election, he quickly built a large following with his readiness to criticize the CPP and CNRP in equal measure. Kem Ley’s message had seemed to be seeping through to both parties. 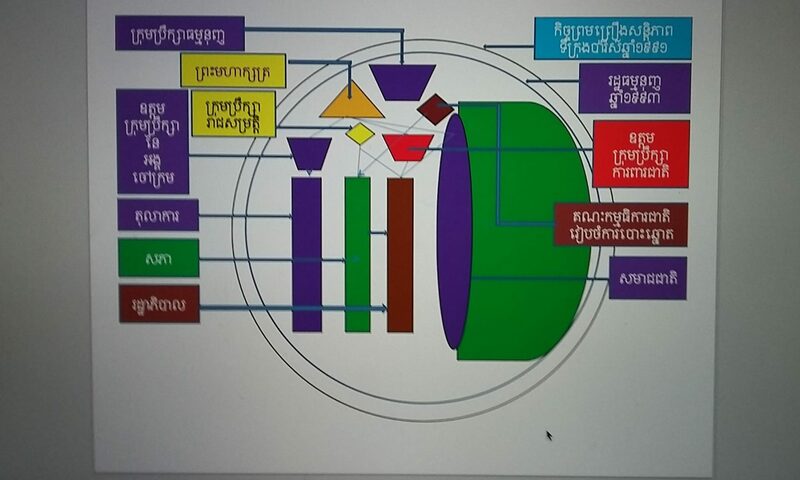 On the back of Kem Ley’s advice, the CNRP’s Sokha announced that tycoons who had grown rich under the CPP would not fear reprisals or seizures of their wealth if the CNRP came to power but had to be open to reform. Perhaps most importantly for the CNRP’s current standoff with Hun Sen, some prominent government leaders who have long lived in the prime minister’s shadow appeared to be listening to Kem Ley’s message too. Among the slew of reported “moderates” in the CPP, Interior Minister Sar Kheng has most often been pointed to as proof that there remains hopes of change within the ruling party. Notably, it has also often been these officials who the CPP has deployed in its negotiations with the CNRP. 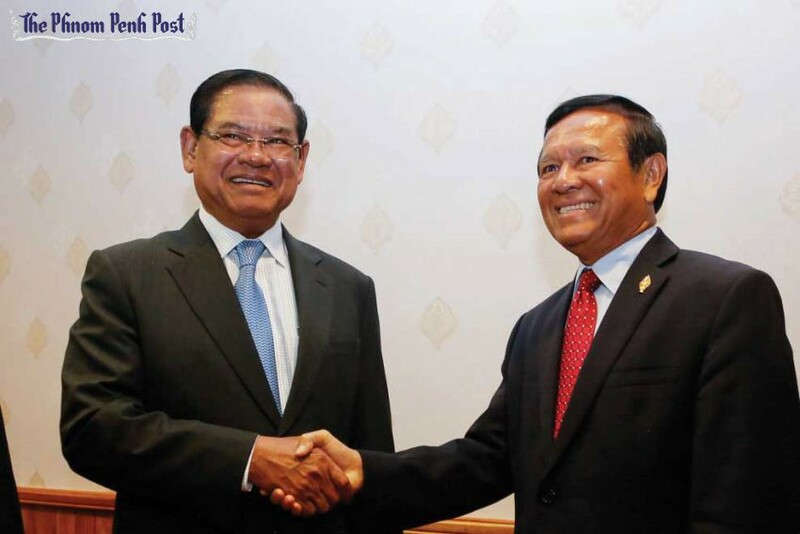 The interior minister has long been Hun Sen’s main rival for power in the CPP, after inheriting a vast patronage network centered on his ministry and in Battambang province in the west from his brother-in-law — the CPP’s late founding president Chea Sim, who died in 2015. According to Brad Adams, who was a U.N. official in Phnom Penh in the 1990s and is now deputy head of Human Rights Watch for Asia, Kheng and his allies even refused to join in Hun Sen’s ouster of his Funcinpec coalition partner, Prince Norodom Ranariddh, in the 1997 factional fighting. Most recently, after Kem Sokha escaped Hun Sen’s initial attempts to arrest him in March 2016, a spokesman for Kheng’s ministry even surprised multiple news outlets over a two-day blitz by announcing that police might refuse to carry out any further arrest warrants issued for the opposition leader. His arrest would cause chaos, he said, and police must prevent chaos. It appeared to be a major opening in the spirit of promoting reconciliation between the parties promoted by Kem Ley, but the reprieve was short lived. Two months later, with Kem Sokha having still not left his sanctuary in the CNRP building and Hun Sen’s arrest threats ramping up, the premier’s top military ally Kun Kim told the media he could have soldiers make the arrest. The next day, the Air Force’s Chinese-built helicopters and Navy speedboats circled the CNRP’s riverside headquarters, where the opposition leader had been in hiding from Hun Sen’s threats for months. In front of the building, balaclava-clad soldiers from Hun Sen’s elite personal bodyguard unit clasping AK-47s repeatedly drove past to hammer home the message. Tensions were clearly bubbling over: the Interior Ministry might refuse to arrest the opposition leader, the message was, but Hun Sen had the military. After Kem Sokha was eventually arrested in September 2017, his predecessor as CNRP leader, Sam Rainsy, then told French-Cambodian opposition supporters in Paris (to where he fled in November 2015 to avoid his own arrest ) that Kem Sokha had “been talking” to Sar Kheng’s associates and that the pair were arranging a direct phone call. The arrest, Rainsy explained to supporters at the December event, had forced Kheng to put his cards on the table before he was ready to and locked him in behind Hun Sen before anything could happen closer to the election. The interior minister has since remained publicly in lock-step behind Hun Sen.